So… your wondering “How do I choose a Prenatal Vitamin?” You’ve come to the right place. Certified Fitness Nutrition Specialist and rising YouTube Star Gabby Farrington answers this question by showing you why Folate is the key ingredient in the Best Prenatal Vitamins. Gabby’s story and background in Organic Supplements makes her the best authority to answer this question. Without further ado, here’s Gabby! As a health and wellness professional for the last four years, I have worked as a Certified Personal Trainer, Certified Fitness Nutrition Specialist, and as the manager of both a fitness facility and supplement shop. My mission is to help people satisfy their nutritional needs and reverse their health problems through vitamin supplements and good nutrition. Needless to say, it has become a necessity for me to understand vitamins, minerals, and supplements in order to help my clients achieve optimal health and reverse deficiencies. I have made it my business to learn (and continue learning) all I can regarding any vitamin and mineral supplement, so I can not only make recommendations to clients seeking to feel and look their best, but so that I may personally enjoy the endless benefits of ideal health and a balanced diet! All of these reasons are why I was so excited to connect with the health-loving folks at DR Vitamin Solutions and to share all they offer with my clients and followers on social media as well as my family and friends! In my experience, finding easily accessible supplements that are of top quality can be confusing and difficult for the average person. When I discovered DR Vitamin Solutions, I couldn’t believe just how many brands they’ve made available through their site, but more importantly brands whose supplements are of the highest quality while also being affordable. Although I have scaled back on my full-time work as a health and wellness professional, it is now more important than ever for me to be filling my body with the most nutrient-dense foods as well as supplements containing the most bio-available ingredients. As an already proud mama of two healthy and happy little girls, I am excited to be at a point in life where I am ready for a third baby. 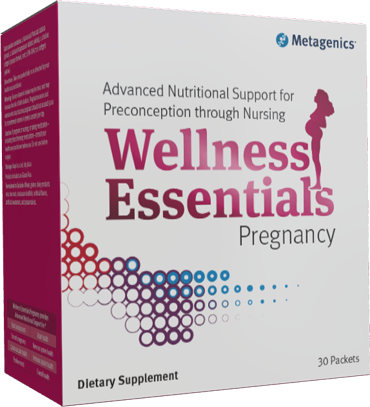 Preparing my body for a healthy pregnancy means being in an excellent state of health BEFORE pregnancy – Metagenics Pregnancy Wellness packets are helping me do exactly that. And they have proven to create the best Pregnancy diet full of essential nutrients and essential vitamins. I have found high quality prenatal vitamins to be one of the most difficult forms of supplementation to find, so you can imagine how excited I was to stumble across the Pregnancy Wellness Packets on the DR Vitamin Solutions site. On the question of “how do I choose a Prenatal Vitamin?” The first thing that caught my eye about these Metagenics Wellness Essentials Pregnancy Packets, was the ingredient list-specifically the ingredient L-5-Methyltetrahydrofolate. For fear of risking boring you to tears, I will spare you the scientific explanation of why this form of folate is exceptional, but rather I will share that there is a glaring difference between the commonly seen folic acid in sub-par prenatal vitamins for pregnancy we often reach for at the grocery store and the easily absorbed L-5- Methyltetrahydrofolate found in the Metagenics Pregnancy Wellness packets. S how do I choose a Prenatal Vitamin? Simple. I look for Folate in the form of L-5- Methyltetrahydrofolate. Folate is essential to the healthy development of cells and plays a key role in the construction of DNA. (1) But this isn’t the only ingredient that stood out to me as exceptional for moms to be and pregnant women. These vitamin packets are loaded with other key ingredients for optimum nutrition during pregnancy such as vitamins A, D, E, & K, iron, magnesium (nature’s magical relaxation supplement and can potentially lower the risk for premature labor), and essential fatty acids, to name a few. Okay, okay, so by now you understand how noteworthy the ingredients are, but let’s talk about something a little more simple, but nonetheless important-CONVENIENCE. I can’t tell you how many times I’ve accidentally skipped doses of my supplements because, quite frankly, I’ve just had too many bottles on hand and struggled to remember which bottle in the lineup I needed to reach for next. The Pregnancy Wellness packets have completely eliminated that struggle for me. By condensing my daily doses of minerals and prenatal vitamins for pregnancy into one packet, one a day. Have you ever taken dietary supplements and almost instantly regretted it when, moments later, you experience those horrible tasting vitamin burps? Thankfully, since taking my Metagenics Wellness Packets, I no longer experience that side effect! I make sure to take my vitamin packets right after I’ve had a breakfast that contains plenty of healthy fats (this is very important for the proper absorption of fat soluble vitamins A, D, E, and K) and then wash it down with at least 8 ounces of water. Voila! No trace of vitamin-tasting burps to be found! …And as if I wasn’t sold on the Wellness Essentials packets already, I’ve noticed two additional bonuses in my body since I started taking them. Benefit 1: My skin has become noticeably brighter. Benefit 2: my energy levels seem to be on the rise! I attribute the improved look and feel of my skin to the EPA as this omega-3 fatty acid is known to slow down the skins aging process while also acting as an anti-inflammatory. While I am loving how my skin looks and feels since beginning my Wellness Essentials regimen, I am equally pleased with the boost in energy and overall feeling of well-being I have. I am currently 13 months postpartum from my 2nd child and still breastfeeding, which can take a significant toll on the body if you aren’t taking in adequate nutrients. Before getting my hands on my Metagenics supplement (which is recommend for use before, during, and after pregnancy), my energy levels were at an all time low. Between the demands of chasing after two kids, breastfeeding, and keeping up with all the other rigors of motherhood, my body was being deprived of all the important vitamins and minerals it needs to live happily and healthily. Now that I’m in a place where I feel physically well and am confident in the product I am taking to help me achieve optimal pregnancy nutrition, I am so excited to share my experience and this product with YOU. It’s time to stop settling for the lesser quality prenatal vitamins we grab at the store because they’re the cheapest-you deserve more. Your body deserves more. Every pregnant woman deserves more. And MORE is exactly what you get with the Metagenics Wellness Essentials Pregnancy packets. If you are wondering “how do I choose a Prenatal Vitamin? Choose Metagenics. Why? Because it uses the best Folate on the market so you can have a healthy pregnancy. Your success is our passion. If you have any questions or contributions concerning How do I Choose a Prenatal Vitamin, please contact us via email or phone-call. We are constantly looking for new information to promote wellness – and hearing from you would make our day! Feel free to reach out to our free Health and Wellness Consultation headed by our Certified Health Consultant, Kurt LaCapruccia, D.S.S. (Diploma in Dietary Supplement Science). Always consult with your Health Care Professional before you begin any pre pregnancy or postnatal vitamin routine. This entry was posted in Guest Post, Informational, Vitamins & Supplements and tagged Folate, How Do I Choose a Prenatal Vitamin?, prenatal vitamins for pregnancy on 03/25/2019 by DR Vitamins.